With Halloween near, pumpkins carved and all things spooky in the air, it seems fitting that we venture to our favorite destination in Oregon, Gravity Falls. Gravity Falls is Disney’s animated adventure for children that is full of mystery and excitement following the adventures of Dipper and Mabel, twin siblings spending summer with their Great Uncle. 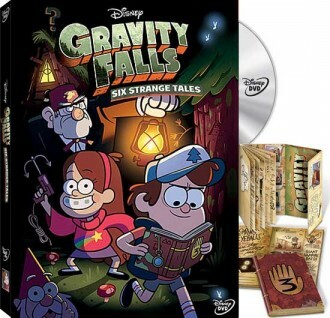 In the latest DVD release Gravity Falls – ‘Six Strange Tales’ we uncover all fun from the Mystery Shack as this tourist trap nabs customers’ money in the visiting. This DVD, arriving on October 15th comes fully loaded with over 2 hours of shows and an awesome FREE Exclusive Mystery Book: Journal #3. To begin, the journal is a fantastic edition to this DVD release. The artwork found inside is wonderfully illustrated, and contains all the elements you uncover throughout this dark humor series that begins with the first episode “Tourist Trapped” when Dipper uncovers the mysterious journal complete with a map of Gravity Falls, Gnomes, Undead, Floating Eyeballs and to top it off, Gravity Falls postcards filled out by your favorite unforgettable characters. This journal adds just the right touch to this package being printed on plus matte stock with areas for you to write in your own Gravity Falls experiences. When it comes to the ‘Six Strange Tales’, this DVD is fully loaded. From a pristine DVD transfer, the animation looks beautiful. The hard edge lines and bright contract colors really pop and add to the story telling. In the first story, ‘Tourist Trapped’, we learn what exactly Gravity Falls is when Dipper (Jason Ritter) and Mabel (Kristen Schaal) go to live with their Great Uncle (Alex Hirsch). While there, spending the summer, Mabel’s new boyfriend seems unwittingly different and forces the twins to come to terms with learning this town has odd and strange secrets (including a rainbow puking gnome). This really sets the tone for the series. We learn just who the twins are, the Great Uncle’s agenda, and how Gravity Falls needs to be explored. As you continue to watch the release, you cannot help but soak up all six strange tales in one sitting. The series is so great, and brilliant that after the first episode you are hooked. Continuing with ‘The Legend of the Gobblewonker’, where rumors are spread that a Lake Monster is living in the lake not too far from the Mystery Shack, to ‘Headhunters’ as Dipper and Mabel uncover a a secret door and a forgotten Wax Museum, to disc highlights such as ‘Dipper vs. Manliness’ where he learns about danger, being a man and encounters a talking bear, this series and collection of “Six Strange Tales” IS NOT TO BE MISSED! Gravity Falls ‘Six Strange Tales’ brings something unique to animation that has been missing from some time, WIT! Gravity Falls ‘Six Strange Tales’ brings something unique to animation that has been missing from some time, WIT! The show is smart, witty and funny. It doesn’t take the normal route and treats its viewers as education children and adults who can follow the odd humor, jokes, puns, and most of all make you laugh along the way. Gravity Falls talks to you as a viewer, not down to you at anytime. And with characters like Great Uncle, you cannot help but laugh, shake your head, and also laugh along with him dim witted guidance. And let’s not forget the trippy, music from the show opener, and continues throughout the show. It sets the fun mood and feel of the show. Shows like Gravity Falls happen once every so often, and this one hits the mark. The eccentric characters reel you in as the stories unfold into oddly strange tales leaving you wanting more. Shows like Gravity Falls happen once every so often, and this one hits the mark. The eccentric characters reel you in as the stories unfold into oddly strange tales leaving you wanting more. You are often found at the end of your seat waiting for the next show to begin. If there was one thing you could ask for more in this disc, is when can you get your hands on more strange tales from the Mystery Shack! This is a series to grab your hands on and really is a gem just in time for the Halloween season. So fire up the popcorn, dim the light, and get ready for the strange because Gravity Falls ‘Six Strange Tales’ is a Must-Have for any animation fan, those who look for the strange and odd, or just families looking for a smart, witty show to share together.